Past painting: Louis-Pierre-Alphonse Bichebois. Cathedral of St. Basil the Blessed, Beginning of 19th Century. On an earlier (1902) painting, Apollinary Vasnetsov depicted Moscow of the time of Ivan the Terrible. This is Red Square of 1550s: Cathedral of St. Basil the Blessed is still under construction, and Kremlin walls are white which is a questionable hypothesis for this historical period. Buildings are lined up along Kremlin wall and the square is full of rushing merchants and horse riders. On the right, similar to the previous image, we see a gun turret that did not survive to our time. 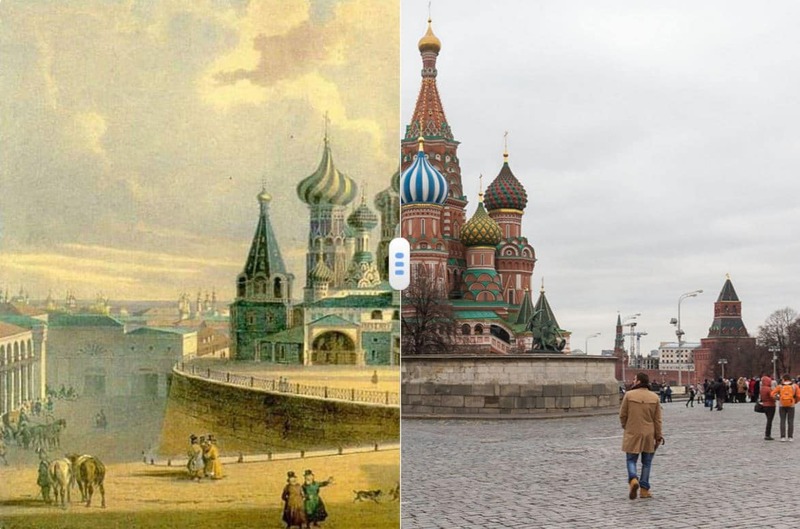 Compared to the past, modern Red Square looks empty. The Kremlin is now red and looks very different, and the only building along its wall is Lenin’s Mausoleum. The painting of another great Russian historical reconstructionist is artist Fedor Alekseev, to whom his contemporaries referred as the “Russian Canaletto.” He gives a picture of a very different, much later Red Square. The artist depicted it completely empty. We see the center of Moscow from the height of a three-story building. From behind The Cathedral of the Intercession of the Virgin (Cathedral of St. Basil the Blessed), a densely populated city peeks out, stretching out to the horizon. In the center of the painting is Lobnoye Mesto () where the tsar’s decrees were announced to the public, and executions and public punishments took place. The Kremlin already has its familiar shape, especially noticeable in Spasskaya Tower, but the square itself is still filled with buildings, mostly merchants’ shops. 1830-s painting of Karl Rabus depicts Cathedral of Intercession of the Virgin (Cathedral of St. Basil the Blessed) from the intersection of Varvarka street and Vasilievsky Spusk (Vasilievsky Descent http://wikimapia.org/1634295/Ploshchad-Vasilyevsky-Spusk ) This is, perhaps, the most well-known cathedral in Russia, both then and now. In the painting the Sacred Procession is descending from the cathedral, and passersby are bowing down in worship. It is amazing, but from this angle, it seems that nothing has really changed, except for some details. In place of the street from where artist created his painting is the construction site known as Zaryadye, now being developed into a large park, and the house with columns on the right has been replaced with the building of Sredniye Torgovye Ryady (Средние торговые ряды). However, comparing the previous painting to the next, by Fyodor Alekseev, “View of the Cathedral of St. Basil the Blessed from Moskvoretskaya Street”, much has changed from the past. This once densely populated location transformed into an off-ramp from the bridge to the river embankment. The whole place is now given to automobiles. It is interesting that the true “point of drawing” is located somewhere inside the bridge’s ramp. In another painting by Apollinary Vasnetsov “Bookshops on Spassky Bridge, 17th Century” we can see the now-filled-in Alevisov Moat in front of Spasskaya Tower on Red Square. This moat was not only the last barrier to the Kremlin’s various historical enemies, but was also home to exotic animals. It had a system of sluicegates to allow parts of it to be drained independently. During the regency of Ivan the Terrible, the section by the Voskresenskie Vorota (Resurrection Gate) of Kitai-Gorod was dry and housed lions sent from England. Thus, the gate became known as “Lions Gate.” In the 17th century, at the time presented at this painting, an elephant lived in the moat. It was a gift the from Persian shah Abbas II to the Tsar Aleksey Mikhailovich. Unfortunately, the elephant soon began suffering from a gastric distress and, with an onset of cold weather, died. After the War of 1812, the merchants’ shops along the moat were demolished and the moat was filled.